Local history of a file is maintained when you create or modify a file. Each time you edit and save a file, a copy of it is saved. This allows you to compare your current file state to a previous state, or replace the file with a previous state. 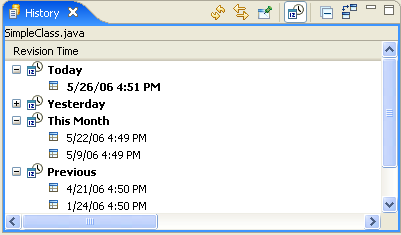 Each state in the local history is identified by the date and time the file was saved. Neither projects nor folders have local history. To view the local history of a file, choose Team > Show Local History from the pop-up menu. This will bring up the History view and populate it with the revisions of the selected file. You can open different revisions from the table (by using Open from the context menu or by double clicking on a revision), compare them against the latest revision or against a previous revisions (by using Compare With Revision from the context menu), and replace the current revision with the contents of a previous revisions (by using Get Contents from the context menu). Note: Projects that are managed by CVS now have the local history revisions displayed alongside remote revisions. In order to see the local history for a CVS managed file, select the Team > Show History menu item and make sure that the History View is one of the modes capable of showing local history. This command refreshes the contents of the view, fetching the latest history information for the resource from the server. When enabled, the view will display the history for the resource of the active editor or of the active selection. When enabled will pin the view and its contents. Any new requests for history will open a new instance of the History View. Will the view is in the Group by Date mode, Collapse All will collapse all of the date categories. When enabled, a double click (or a single click depending on your Open Mode strategy set in Preferences>General) will open a compare editor. When it is disabled, clicking on a revision will open that revision. This command will open the contents of the selected revision in a read only editor. (The editor used is the one that is registered as the default editor for the file type). Note: If the revision being opened is the current version of the file, then it will be opened in a regular editor. The compare command differs based on the number of revisions selected in the history view. For a single selection, Compare Current With Revision will the compare the current version of the resource with the selected revision. For two selections, Compare with Each Other will compare the selected revisions. This command will load the contents of the selected revision into the local copy of the file whose history is displayed in the view.